As 2016 approaches, homeowners will be turning their thoughts to how they can improve their home and their lifestyle in the New Year. Whether you’re thinking of selling and dreaming of a new home, or edging closer to retirement and want an extra room to relax or a hobby space, a conservatory is always a good investment. Rather than pay double the price for a company to build a conservatory, it’s much more cost efficient to purchase a self-build conservatory and do most of the hard work yourself. However, a DIY conservatory option takes a lot of planning – here’s what you’ll need to do. With DIY conservatory specialists such as Prior, you have the option of purchasing a standard conservatory or building your own which is made to measure. The modular option is fast and simple and you can obtain an instant quote. However, if you want a slightly different shape or a custom design to your exact requirements, then the bespoke conservatory builder is for you. Before deciding on any home extensions, it’s vital to find out if you’ll need planning permission to carry out the work. In most situations homeowners do not need planning permission, however there are exceptions, especially if you are planning a large conservatory or live in an area of natural beauty. Always check. 3. How DIY can you go? Once you have decided which type of conservatory or orangery you’d like, it’s time to figure out how you will build it. If you are confident with your DIY skills and have all the right equipment, you could build the entire conservatory and save thousands of pounds. However, if you don’t think you’ll be able to build a damp course and a wall, then you’re best leaving this job to the professionals. If you have skilled family members this could be a group effort – just decide which jobs you can trust to do yourself and which need outsourcing. 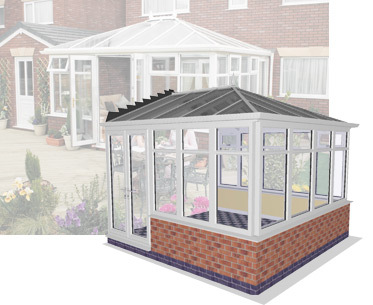 Conservatories can take time to build, from a few days, to longer depending on its size. Plan a schedule which is convenient for you and your team, making sure everybody knows when to arrive to do their job. Just one delayed person can push back the time of completion. You may also need to consider the weather and if this could impact the schedule. If you need any more help planning a DIY conservatory, please contact us and we’ll offer our free advice.